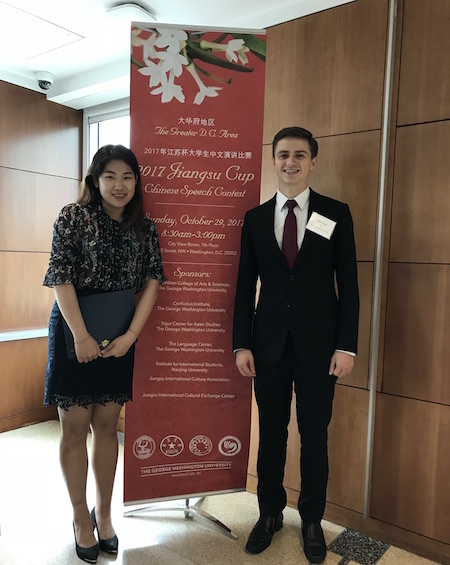 Our students James Olsen and Minji Kim (pictured on the left) won Silver and Bronze awards respectively at the 2017 Jiangsu Cup Speech Contest. 16 participants from universities, such as Georgetown University, American University, University of Virginia, George Mason University, Liberty University, in the greater Washington area competed in two rounds with the final round held on October 29 at the George Washington University. The awards include a trip to the Jiangsu Province of China in summer 2018 and scholarship opportunities to study in China as well. This is the 7th year of this speech contest. GW students of the Chinese language and culture have consistently excelled in these contests. Congratulations to James and Minji for their great performance at the contest and their achievements in the Chinese language and culture. Kudos also go to our faculty members Professors Hang Zhang and Qingming Zhou for coaching these students before the contest.